'I remember how, sitting at the piano in the orchestra, my breath was taken away by every phrase, every musical idea, as if a thousand electrical charges were piercing me.' This is how Mieczys³aw Weinberg later described a pivotal moment in his life - a performance of Shostakovich's Fifth Symphony in 1940. At the time, Weinberg was 21 years old, and had recently arrived in Minsk in Belorussia as a refugee from the occupied Poland. Having begun his studies at the Warsaw Conservatory, he was able to continue them in the USSR, moving to Moscow in 1943, at the direct invitation of Shostakovich, who had been impressed with the score of Weinberg's First Symphony. Both composers worked across a wide range of genres and in a gamut of styles ranging from folk idioms (including, especially for Weinberg, Jewish ones) to twelve-note themes. Yet the influence went in both directions, and the musical relationship was a dialogue as much a mentor-disciple one. Like Shostakovich, Weinberg left an imposing body of symphonies and string quartets, as well as a number of sonatas. 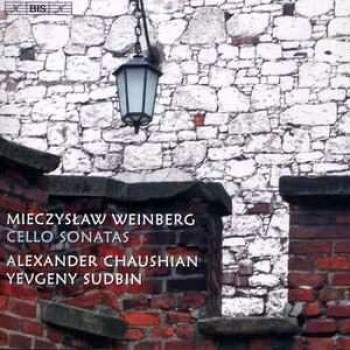 Three of these are recorded here, by young, award-winning cellist Alexander Chaushian, joined in the two accompanied sonatas by Yevgeny Sudbin at the piano.